3. 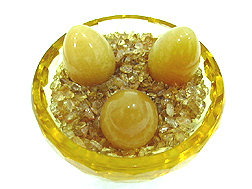 Golden Eggs made from yellow jasper. 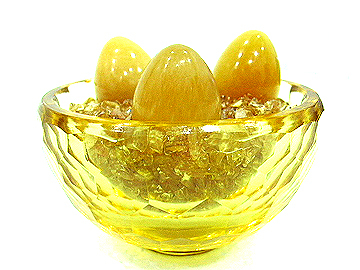 Genuine yellow citrine had been endorsed by all Feng Shui masters to be the "Period-8 Merchant Gemstone". This is because period 8 (2004-2024) is earth element. Citrine being dugged from the earth is filled with pure earth energy. Furthermore its yellow color will further complement its earth energy. Therefore, citrine would be the most important crystal wealth energizer for Period 8. This item will invite more solid wealth luck and income luck for you throughout the next twenty years (2004-2024). Citrine is capable to increase income, speculative and wealth luck! On the other hand, the golden eggs harvested from the wealthbowl connotes outstanding yield. For example if one invest, it will give you strong positive returns. If one is banging on his career, he will earn a lot of money from the career. For those who desires speculative luck, you can keep your lucky lottery ticket or number into this wealth bowl to harvest good results. This wealth bowl will create wonderful sparkle into your living room and it passes to us excellent wealth energy! Sparkling beautiful with harvesting eggs! Wealth bowls depicting treasures overflowing with gold ingots is extremely auspicious to accumulate abundance of wealth in your business premises and homes. In Asia, nearly all successful shops will have this powerful symbol at their reception or cashiers to attract in prosperity luck and lots of fortune. They are also often seen placed near Wealth Gods such as Tua Peh Kong or Chai ShenYeh. Also display this wonderful energizer of prosperity luck on your desk to attract lots of wealth and good fortune into your office. Good wealth bowls must look as if they are overflowing to ensure you will enjoy abundant wealth in life. 1. Display the wealth bowl in your living or family rooms, business premises and offices, especially in southeast corner (wealth corner) to activate and enhance your wealth luck. 2. Display the wealth bowl facing your entrance so that you can see it as you enter to invite wealth and multiple fortune luck into your homes at chi entry points. 3. Display the wealth bowl in your office and shops to ring in more sales and achieve more monetary gains and successes. 4. Display the wealth bowl in the Northwest sector to activate your financial support luck for money finding opportunities. 5. The wealth bowl image is a must for Tycoons and for those doing any kind of business seeking for success. The symbols sends vibes to our minds to remind us of money seeking opportunities. Note: Do not place wealth bowls on the floor, toilets and kitchen.